We’d love your help. Let us know what’s wrong with this preview of Remember to Pray by Simone DaCosta. 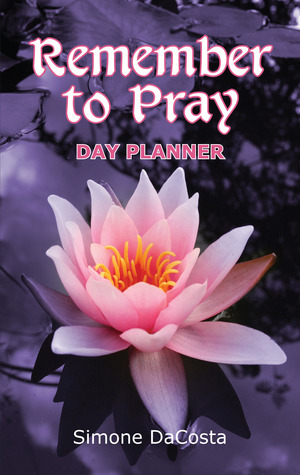 Beautiful spiritual planner offers simple guidelines that will help lead to a beneficial and meaningful prayer life. To ask other readers questions about Remember to Pray, please sign up. I received this book through a First Reads Giveaway. I was interested in getting a copy of this book, because I have been thinking a lot lately about habits for spiritual growth - what I would expect of them and what they would entail. I love keeping journals and notes of just about everything, so I wanted to get to hold this book and really get a feel for it. The journal section has adequate space. It is colorful and uplifting, while still being utilitarian. The advice and direction, especially t I received this book through a First Reads Giveaway. The journal section has adequate space. It is colorful and uplifting, while still being utilitarian. The advice and direction, especially the comments on openness and sincerity, proceeding the journal exceeded my expectations. The style was direct and concise. There was no jargon and there were no complicated ideas to muck up the simplicity of prayer. It was just guiding and encouraging. While it is written from a definite Christian perspective, being non-Christian, I did not find the author's point of view intrusive. I could use this book to study the Bible as literature or I could use it as a log for meditation or any other non-Christian prayer, just as well as a Christian reader could use it. I think that is the highest praise that I can give a book related to spirituality, that it succeeds in reaching out and doing what it was intended to do, regardless of the reader's background.